The two million dollar fine handed out to Jammie Thomas by a Minnesota jury this week hasn't done the music industry's image much good. While lawyers and high level managers at the major labels cracked open the Champagne, artists such as Moby and Radiohead shook their heads in shame at what the music world has become. Earlier this week the case of Jammie Thomas versus the RIAA went up for re-trial before a new jury. She was found guilty of sharing 24 songs using Kazaa and ordered to pay $80,000 per infringement, which all mounted to a total of $1.92 million in fines. High ranking people at the record labels soon declared victory claiming that justice had been served. However, many of the artists to which the record label executives owe their well paid salaries are disgusted by the outcome of the case and the witch-hunt on their fans. 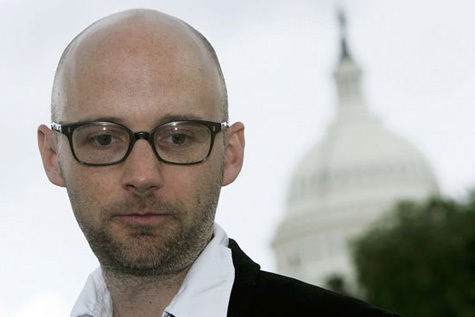 One of the artists that has shared his disappointment at the disproportionate fines is the American musician Moby. “Argh. what utter nonsense,” he writes on his website. “This is how the record companies want to protect themselves? Suing suburban moms for listening to music? Charging $80,000 per song?” he questions. Moby is right that the sue and scare tactics of the RIAA are not the ideal business model in the long run. However, thus far they have made millions from all the settled cases alone. In recent years over 30,000 people have allegedly settled with the RIAA for an average of $3500 dollars. This means that the RIAA have raked in more than 100 million dollars without even having to go to court. In the UK, a coalition of top artists have spoken out against the actions of a music industry that chooses to criminalize their fans, and expressed their growing discomfort with record labels abusing copyrights for their own benefit. Radiohead, who are also part of the coalition, even showed interest in testifying against the RIAA in the case of a Boston University student also accused of sharing several music recordings. Tenenbaum’s troubles started in 2003 when the RIAA rejected an offer to settle for $500. After a few more settlement attempts and legal quibbles, the case eventually went to court. Moby, a proponent of Net Neutrality – another topic dear to most file-sharers – is equally dissatisfied with the RIAA’s tactics. In his view, it would be better for both artists and fans to end all the legal quibbles and focus on the art of music instead. “I’m so sorry that any music fan anywhere is ever made to feel bad for making the effort to listen to music,” Moby writes, ending his blog post with some solid advice for the record labels that pump millions of dollars into the non-profit organization. “The RIAA needs to be disbanded,” he writes. c There are 275 comments. Add yours?